2 Feb: AWS Work and more! It has been a busy few days! This week has been a better weather week so we’ve been able to visit a few weather stations! We made a few attempts to get to Windless Bight AWS. 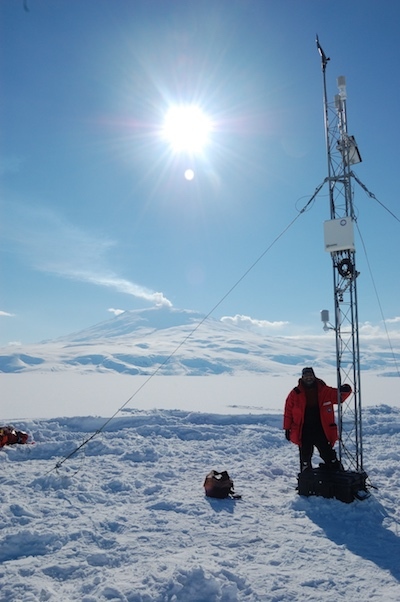 This weather station is located near McMurdo Station. 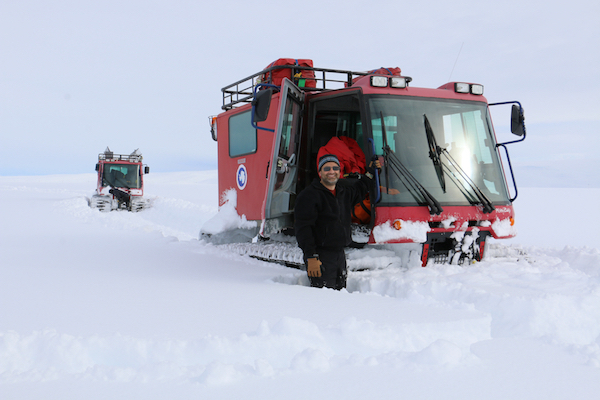 It is not something we can land a helicopter at, due to the soft snow surface. So, we have to drive out. 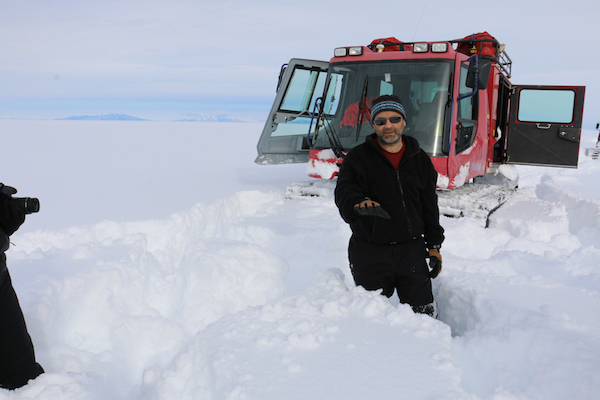 The first attempt didn’t work out – the snow at this location was so very soft and very deep! We drove out on a tracked set of vehicles called a Pisten Bully. 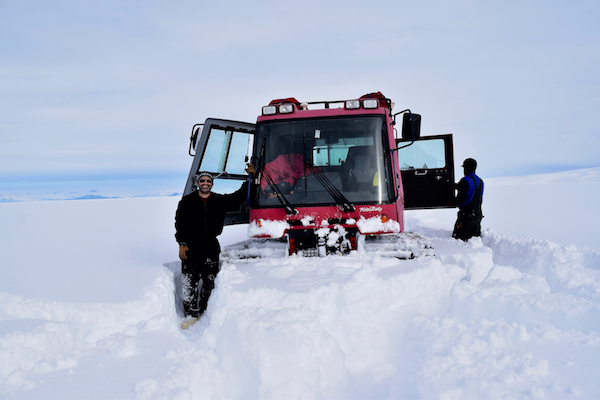 Another attempt was made by some Antarctic support staff to help us get a new tower installed for our weather station (we didn’t go as we had another AWS to fly to and service!). 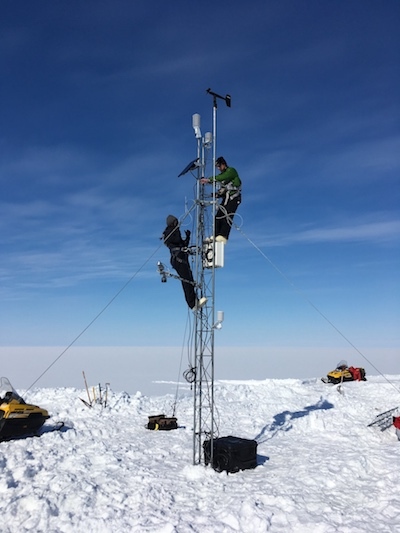 Hence, we snowmobiled out to the site, and installed the AWS electronics and sensors on the new tower. Windless Bight is one of my favorite places – if you stop moving around, it is a very, very quiet place. There is little wind. (Hence, the snow that falls here sticks around and is very, very soft!) It is also a great spot to view Mt. Erebus – the world’s southern-most active volcano! 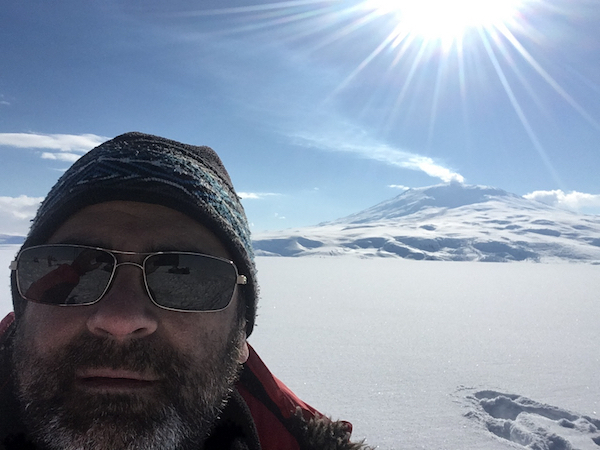 Right here on Ross Island, where McMurdo Station is located, this volcano isn’t really like ones you might think of in Hawai’i, but more like one with a bit of steam, etc. On this very sunny day, you can see the plume from the top. 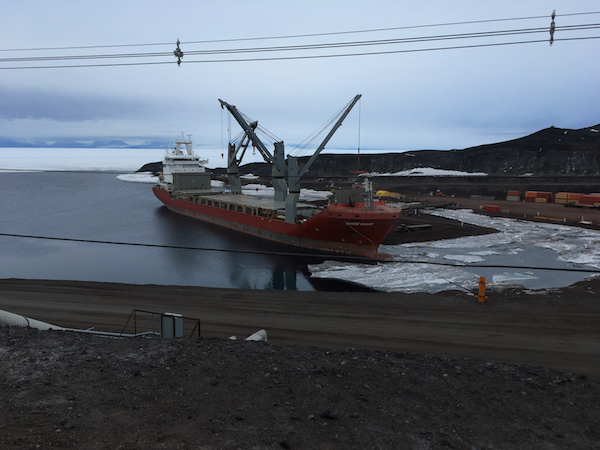 Another AWS we serviced was Elaine AWS – on the Southern Ross Ice Shelf. 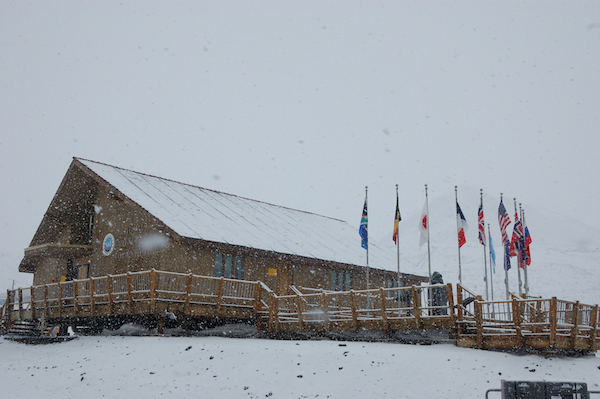 This station is near the TransAntarctic Mountains, and is a 2 and half hour flight on a twin otter fixed-wing airplane. We refuel part way there, near the Holland Range, then get to find Elaine AWS. These stations on the ice move – as the ice is moving. This makes finding them a bit of a challenge. Luckily, I spotted it, and we had a great day servicing the station. One question that you may wonder – how do we name our weather stations? Some are named after existing geographical features already named (e.g. White Island, Marble Point, etc.). 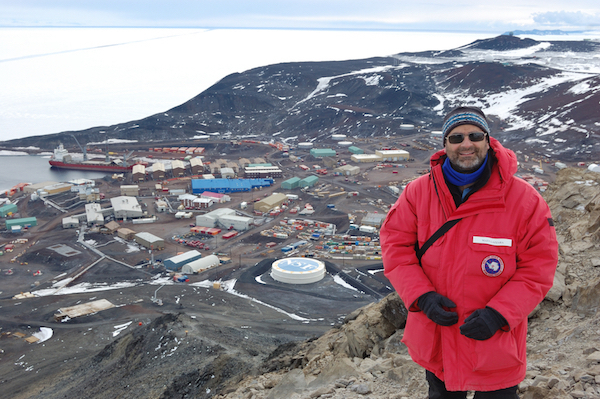 Others are named for people important in Antarctic meteorology (e.g. Austin, Kathie, Schwerdtfeger, Lettau, etc.) Others are named for those who have supported us (e.g. Marlene, Henry, Kominko-Slade, etc.) or family members…however, none are named for those of us who actually deploy here to work on the project. This past Sunday, I took a short hike to the top of Observation Hill. This is the large hill that is right next to the station – and roughly separates McMurdo Station (USA) from the New Zealand station, Scott Base. 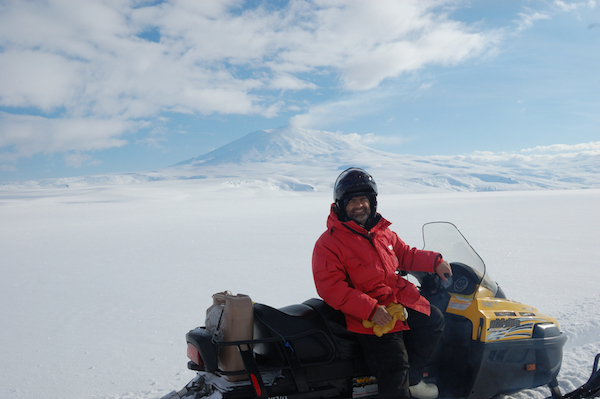 It has a great view of McMurdo and surrounding areas. 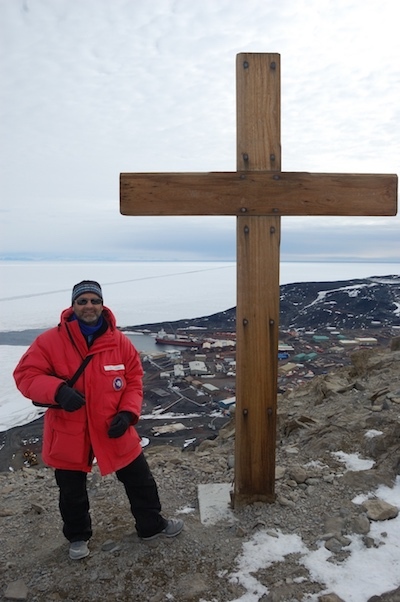 It is also a famous location – used by the early explorers of Antarctica to watch for returning expeditions to South Pole. One such expedition did not make it back, Sir Robert Falcon Scott’s trek to South Pole in 1912, never did make it back. A cross has been place at the top of the hill in honor of him and his party. It still standing there to this day. After a long period of few flights on and off continent, we did not get any “fresh” vegetables or fruits (or even eggs for that matter!). Finally, we got some recently. Some from the Vessel, and even the research vessel….more will be on future flights. We call these “Freshies”. It is so nice to get an apple to enjoy. Eggs are now very popular at breakfast!! 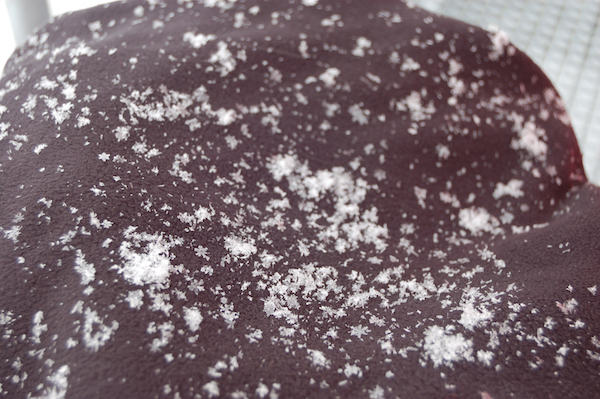 It’s snowing here – photos attached. Posted in Uncategorized	| Comments Off on 2 Feb: AWS Work and more!